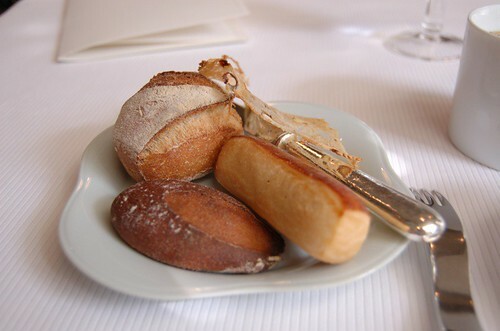 ...Can be found at 34, rue des Rosiers, Paris. Yes, I have not eaten many falafels in this lifetime, and I am by no means knowledgeable about Middle Eastern food. I had my fair share in New York this summer at Mamoun's and Alfanoose, and I swore I was done with falafels for a while. 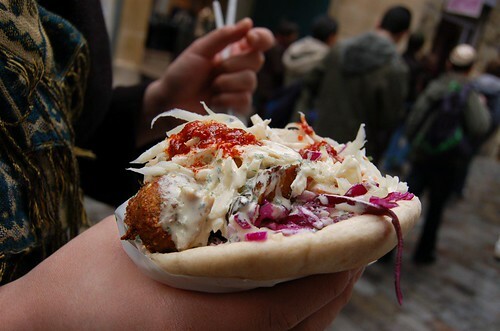 However, L’As du Falafel may have restored my lust for this fine food. This was the best picture I could muster, since they were "NO FOTO! "- ing at me from the second I got out my huge camera. Those crispy chickpea fritters, julienned cucumber, pickled red cabbage, grilled eggplant - all slathered in a rich, creamy tahini sauce - resonate in my mind/stomach. I recently came back from my last spring break in university ever. And you know it's spring break when a quarter of the campus comes back several shades of orange. Well I say, there ain't nothing wrong with spring break with clothes on, and in freezing rain and hail! Even with the terrible weather, walking around London and Paris sans a certain email/text messaging/web browsing device was just so refreshing. The architecture and art was of course beautiful, and the food was equally impressive on this trip. It was great to escape for a week, and now that I am back in the reality of midterms, papers, and projects, I find myself reminiscing over the 900 pictures I took. 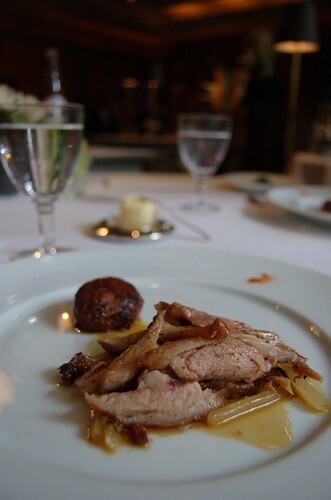 One of my standout meals on this trip was at Pierre Gagnaire, my first three-Michelin-star Parisian restaurant. A and I had literally spent weeks planning out our eating adventures, and after we decided on PG, we were excitedly looking forward to our meal. Its ranking as third in the world by Restaurant Mag (behind El Bulli and the Fat Duck) surely should mean something. 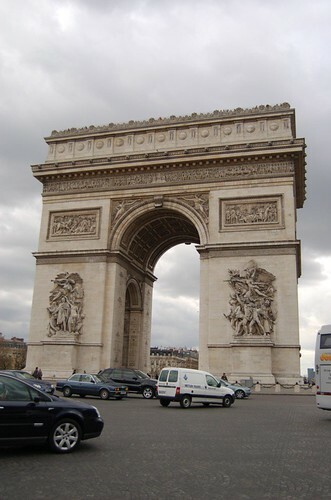 The restaurant is on the charming Rue Balzac right near the Arc de Triomph. The restaurant interior is quite similar to New York's three-star "corporate lunchrooms", which kind of surprised me. 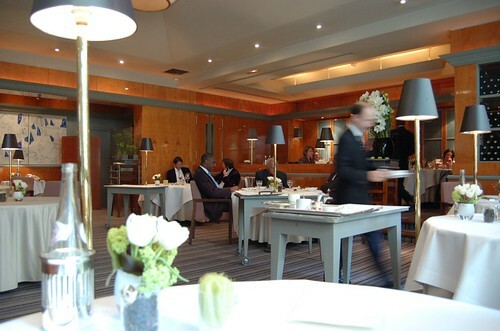 It felt very business, akin to places like Le Bernardin and per se. 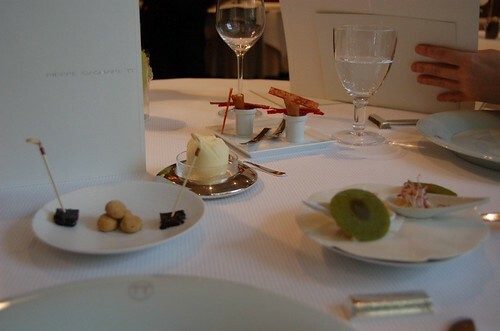 This is not to say that there was no charm, but it was a stark contrast to the grandiose interiors like Le Meurice. 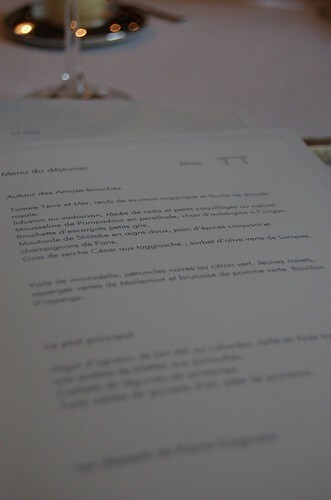 We are seated, and presented our menus, in French of course. Easy solution: go with the prix fixe. Immediately, our amuses come out. As much as I am enamored by our various plates of goodies, I am quite delighted by our gracious maitre d, a cute little French man with an imperial moustache. 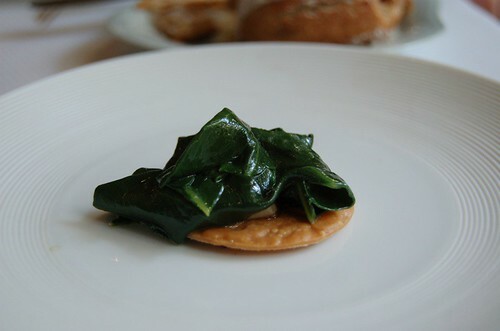 Great flavor and textural combinations. 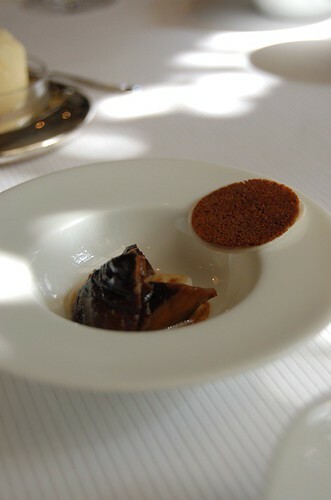 The smoky and salty anchovy went quite well with the roasted nuts in the tuile. This was probably my favorite amuse. The beef had the texture of very moist beef jerky, with the intense flavor of the soy. The ginger cookies were rather sweet and did not particularly taste of ginger. Amazing, amazing bread. Walnut, brioche, white roll, and pistachio crisp thing. We polished off several rounds of this. 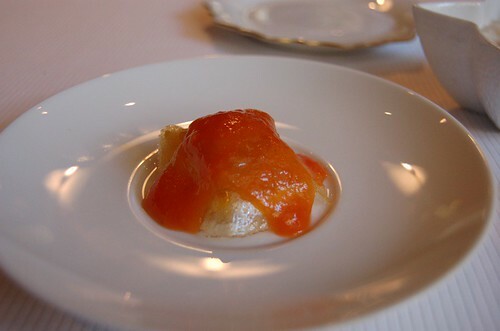 The salmon roe was fresh and delicious, sweet and not the least bit fishy. 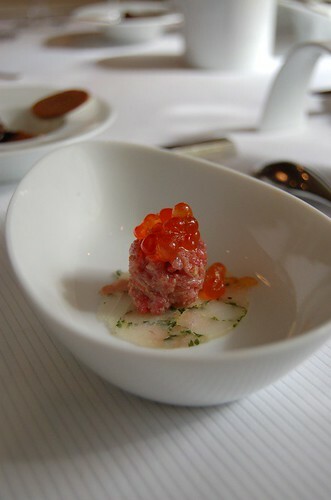 The beef tartare was so light and mild that in my illiteracy, I had initially thought it to be tuna. We weren't too crazy about this one. 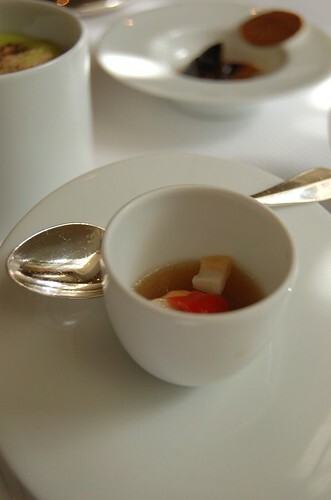 I have no idea what a vadouvan infusion is, but it reminded me of the dashi broth I had at Alinea. The clams were alright but tasteless. One of my favorites. The light, delicate (vegetable?) 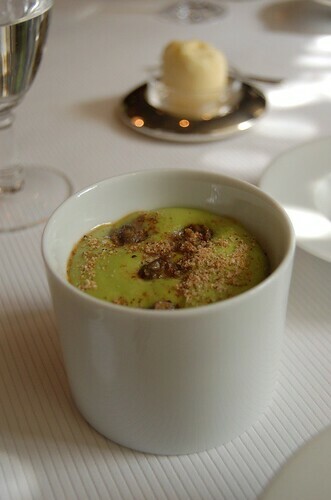 mousse was flavorful and sweet, and became even better with the intensely flavored, tender escargot on the bottom. The menu describes the mushrooms as chanterelle, but we knew them to be shitake. Perfectly cooked and marinated with vinegar, they were great simply on their own; I didn't really understand the pairing with gingerbread, under which was a paper thin slice of raw mushroom. El Random. 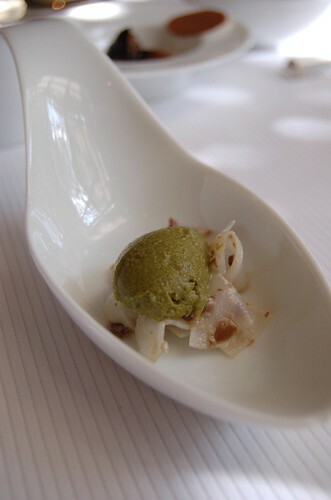 The cold olive sorbet provided an interesting temperature contrast against the tepid calamari. The two olive flavors overpowered the bland calamari, so the calamari brought mostly textural contrast rather than flavor to the dish. This dish had the most ingredients of any dish we had tried so far, and it was amazing how all of them worked so well together. 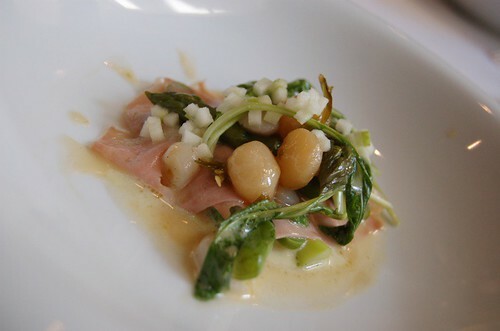 The Mortadella, basically a gussied up baloney, added a great salty note to contrast the sweetness of the tender baby scallops and braised turnips. The turnips, which we initially mistook for cipolini onions were deliciously caramelized by the braising and I could have probably eaten a whole bowl of them. The asparagus had just the right amount of bite to it and prevented the entire dish from feeling too mushy. The acidity in the green apple and lime added bright notes to a dish that could have been overpowered by the creamy asparagus sauce. The lamb was juicy and tender, but surprisingly gamey given that it was lamb and not mutton. 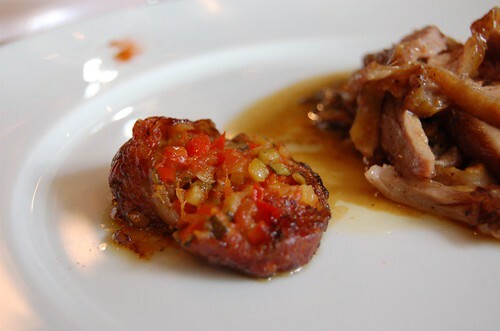 I enjoyed the richness of the fat from the leg and the belly, but some would find it overpowering. The jus was flavorful, but the curry flavor was barely detectable. 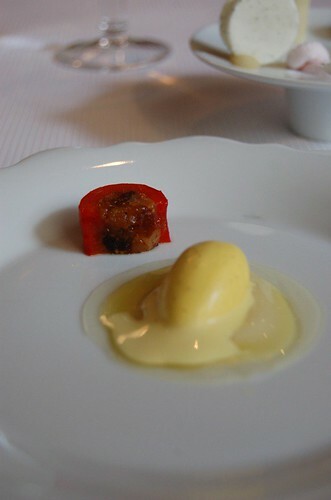 The ratatouille was delicious and beautifully served inside a fried tomato skin. The tart didn’t really go well with the rest of the dish, but I enjoyed eating the roasted garlic cloves with the incredible house made bread. We were instructed to place the caramel on our tongue and let it melt. The strawberry flavored powder started crackling slightly like pop rocks, but the caramel didn’t really melt very quickly so I ended up just eating it. The dark chocolate with kirsch was good, but not outstanding. 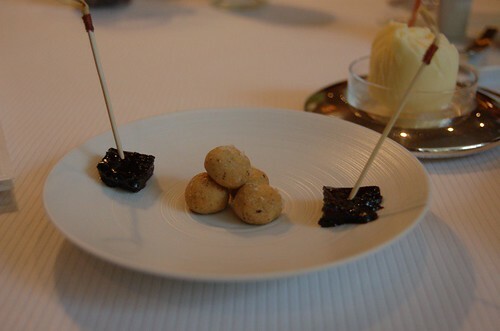 The marzipan cherry was a cute concept: it looked like a cherry but it was actually a marzipan layer outside with a black currant in the very center. 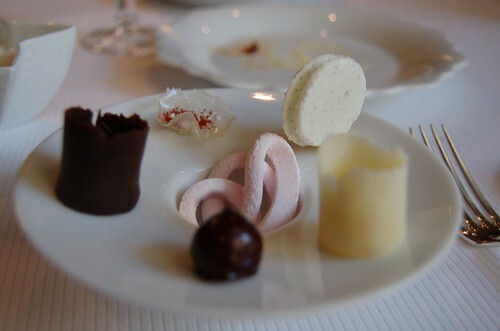 It was more fun to look at than eat, although this might be because I’m not a huge fan of marzipan. I don’t love white chocolate, but the lemon curd was delicious with the chocolate and I liked this one more than I expected. 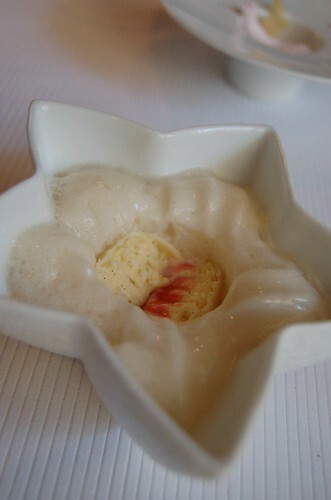 The lemon and almond flavors were great together in the rich ice cream. 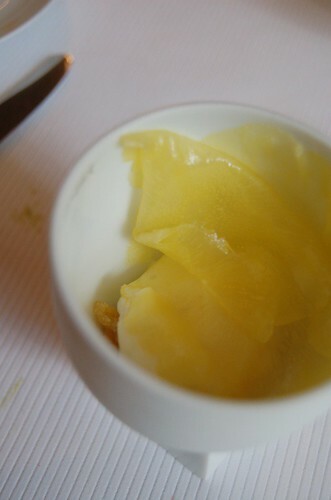 The texture of the gelee was too rubbery for my taste, and I would have preferred the dish without it. I would never have thought to incorporate bell pepper into a dessert, but the combination of the dried fruits with the pepper worked extremely well. The vanilla ice cream was frozen into a round ball. The beer foam surprised me at first since it was so bitter, but the combination of the ice cream, foam, and strawberry puree was very good. It actually tasted a lot like this strawberry yogurt drink I used to have as a child. 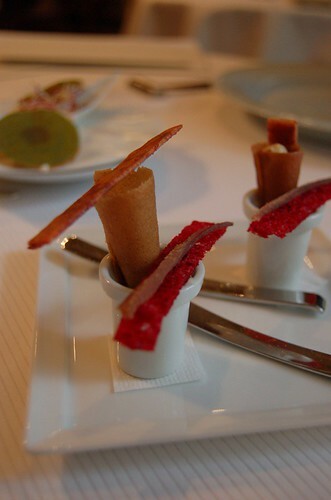 A very playful, rather than refined dessert. 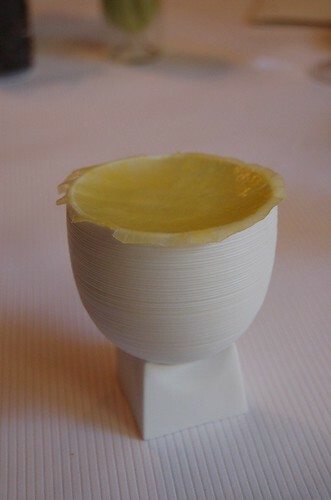 Interesting presentation with a paper thin slice of pineapple covering a bowl filled with lemon sorbet and lemon confit. It was hard to eat because the pineapple shaving was so big. The lemon sorbet and confit was refreshing. I would have preferred this as a palate cleanser between the main course and the desserts. By now you know how I feel about chocolate. This was the most “normal” dessert of the entire meal. 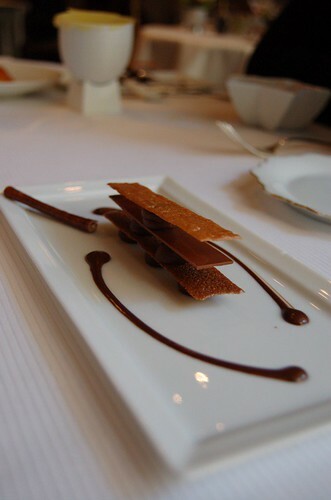 It combined the classic flavors of chocolate and hazelnut, sandwiched by crispy tuiles and chocolate. Not very groundbreaking but good. 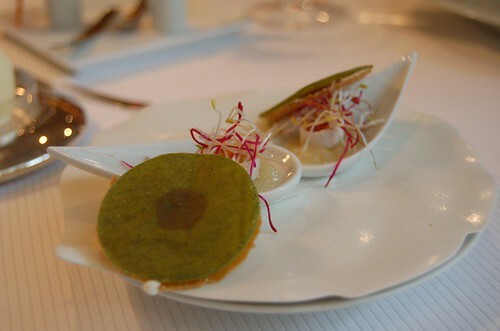 A great meal, with some wonderfully innovative dishes, but I had expected more in terms of impeccable execution. ... and I am doing another late night in a 24-hour library. 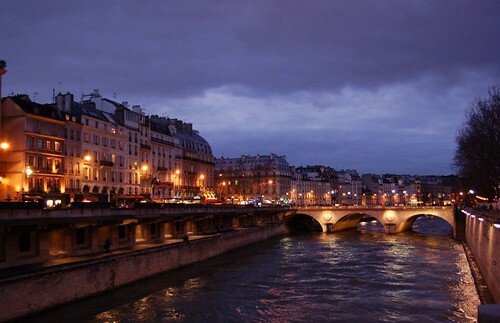 Anyhoo, spring break in London and Paris was amazing, despite the detrimental exchange rate. Many pictures to come.